Ratnabhadra was born into the well-known and noble family of Soksam-khar Drongbu Goshir, in Soksam. He was ordained as a monk at a young age and went on to study at Palden Sangphu, where he received the higher training in Buddhist philosophy, logic, and other fields of knowledge. He travelled throughout Tibet, engaging in debate and discussions on Madhyamika, Prajnaparamita, Vinaya, and Abhidharmakosha at the great monastic institutions. He earned a reputation as one of the greatest scholars of Sutra and Tantra, and became known as ‘Rigpe Raldri’. 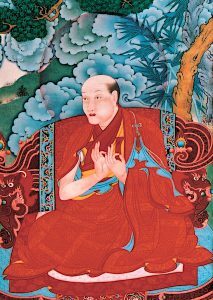 Having met the Fifth Karmapa, Deshin Shekpa, he received the full transmission of the Kagyu lineage and went on to attain complete realisation of ultimate reality. He became one of the most illustrious meditation masters of his time. He passed on the full transmission of the lineage to the Sixth Karmapa, Thongwa Dönden.